In the fall of 2011, downtown Hamiltonians were on edge following a series of random stabbings that left two dead and many others wounded. When the alleged perpetrator began to taunt the police and the community in a series of bizarre social media posts, Hamilton Police were able to acted quickly to identify and locate the suspect using a variety of techniques including monitoring the internet. They arrested Loujack Café in January 2012. The evidence gathered was presented in the form of complex data associated to computer/phone analysis, e-mail content and social media materials, much of which was obtained through the use of the Mutual Legal Assistance Treaty process. Toronto Detective Constable Warren Bulmer was brought on board in May 2013 to interpret and explain the meaning and impact of the data gathered. He analyzed over 200,000 digital artifacts associated to a mobile phone, a computer system, six email accounts associated to the accused and/or unknown persons, seven Facebook accounts associated to unknown persons and a Facebook account associated to the accused. Considered a global leader in internet child exploitation investigations over a decade ago, Bulmer has also been an instructor on conducting computer and internet investigations, the lawful search and seizure of electronic devices as well as the identification, categorization and analysis of digital evidence for the past 13 years. He undertook an exhaustive investigation that led to the prosecution of an extremely violent offender. 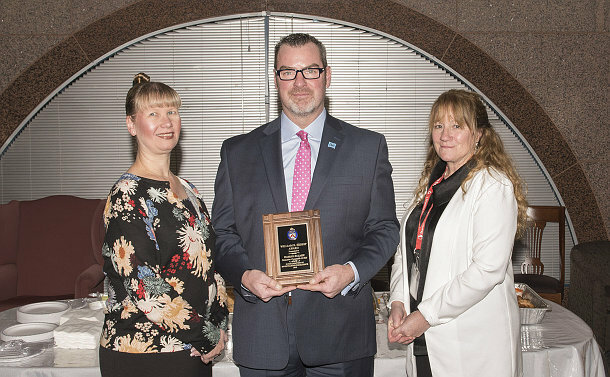 Bulmer was honoured for investigative excellence with the William Bishop Award, presented on November 30. The offences occurred during a nine-month period. All of the victims were selected randomly. All but one were vulnerable persons. Performing the task required Bulmer to read/view and analyze 8,129 e-mail messages, 132 photos sent via phone text messages to e-mail addresses and 183 pages of Facebook account reports. He was also required to review and consider 184,690 individual computer system files in order to determine relevancy. Most of the materials he viewed and analyzed were presented in the form of “data dumps” which were unintelligible even to those considered to be technically proficient. Through a lengthy process of cross-referencing social media posts, cell phone records, data on cell phone drives and GPS records, Bulmer was able to prove the identity of the perpetrator and establish his physical presence in close proximity to the crime scenes. Bulmer prepared a 2,270-page report that provided the basis for the opinions that he formed. It essentially provided a road map to the Crown, demonstrating the clear linkage between the accused, the seized mobile phone, and data obtained in relation to the Hotmail and Facebook accounts and related postings. He formulated an additional 127-page report to deal separately with the one count of First-Degree Murder. On August 17, 2014, Bulmer was declared as an expert witness in matters relating to computer forensics, social media content, and e-mail content at the trial of Loujack Café. Café was found guilty and sentenced to 25 years. Defence counsel informed the Crown that Bulmer’s testimony was strong. “Warren’s testimony yesterday was remarkable. In 30 years of practising law, I have never heard a more professional and unbiased police expert,” said Chris Hicks. In 2016, Bulmer prepared an additional 355-page report that dealt with the remaining charges for the second trial. The report provided similar information as that utilized in the previous trial. On November 11, 2016, Bulmer was again declared an expert witness by the trial judge. Financial Crimes Detective Sergeant Ian Nichol, who nominated Bulmer for the award, attributed his painstaking effort and flawless testimony as pivotal to the success of the investigation and conviction. Café was convicted on all counts and sentenced to an additional four life sentences for the attempted murder counts and an additional five years for the aggravated assault. Sergeant Daryl Reid, the lead investigator, and Staff Sergeant Steve Hrab of Hamilton Police, attended the awards ceremony at police headquarters. Reid said Bulmer’s reputation preceded him. Reid was also very impressed with the way in which Bulmer presented evidence in court. Bishop, a retired Superintendent, and his family -- with the support of then-Deputy Chief William Boothby -- established the award 23 years ago. Elaine Cernowski, the daughter of 86-year-old Bishop who was unable to attend the ceremony, and Staff Superintendent Kathryn Martin, made the presentation to Bulmer. “My father wanted me to express to you his extreme gratitude for your work in this case and your daily dedicated commitment to policing this city, and working with all of the extremely talented men and women, both civilian and uniformed, to ensure that the citizens of this world-class city and the millions of visitors each year are protected by a world-class police service” Cernowski told Bulmer. “You went above and beyond to solve these horrific crimes and while the victims have suffered beyond anything that I myself could ever imagine, you have brought closure to the victims’ families and friends. Bishop sent a card that his daughter delivered to Bulmer. “Behind every success is effort… behind every effort is passion… behind every passion is someone with the courage to try,” it read. The son of a retired Hamilton police officer, Bulmer – whose football coach was also Toronto Police officer – joined the Service in 1990. “I was inspired to join law enforcement by the stories of my coach on those many bus trips to games and at home by my dad,” he said. Starting at 14 Division, he was assigned to 55 Division Major Crime Unit in the late 1990s before being immersed in investigation roles since 1999. Bulmer has taught at the United Nations in Bangkok, the Ontario and Toronto Police Colleges and is a contributing author toEvidence and Investigation: From the Crime Scene to the Courtroom.